Manager Aitor Karanka has said Middlesbrough showed "character" in Saturday's 1-0 win at promotion hopefuls Burnley on Saturday. 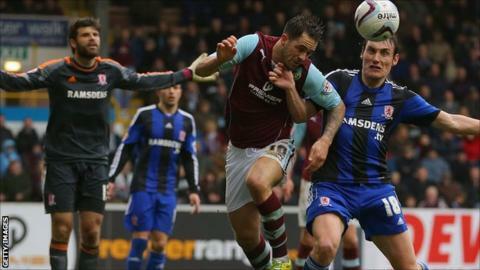 Boro recorded a fourth Championship victory in a row to consign the Clarets to back-to-back home defeats. The win, secured by Jacob Butterfield's goal, came despite a third red card in a week as Daniel Ayala was dismissed. "The most important thing is to win and we're winning in different ways," Karanka told BBC Tees. "When your players play with the intensity and character they played with today in this atmosphere you have to be happy. "We're winning easily or clearly and I am happy. We've won four games in a row and we need to enjoy it." The midweek sending-offs for Kenneth Omeruo and Ben Gibson forced Karanka into a reshuffle of his squad, with five changes including Ayala's first appearance since February after an ankle injury and a start for Jonathan Woodgate after his return against Birmingham. Personnel changes also meant a switch to a 3-5-2 formation, a change from the 4-2-3-1 the Spaniard has adopted for the majority of the campaign. "I needed to solve the problem, and this was the best shape to start the game with," he added. "After 60-70 minutes I needed to change to our normal shape because we were attacking a lot and we went back to how we normally play. "I'm pleased with the players 85-90% of the time, since I arrived they have been playing very well."